The first phase of our project is an interdisciplinacy collaboration between the Oxford Internet Institute and the Oxford Machine Learning Research Group. 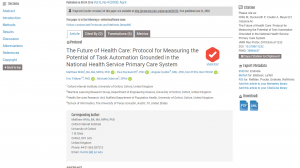 The first phase established a linear scale of automatability grounded in primary care tasks, and developed a framework for the rapid classification of tasks. Eric Meyer is the Chief Investigator of phase one. The second phase of the project explores additional findings and implications beyond the first phase of the project. With a focus on policy, patient impact of automation, and better understanding of how primary care occupations will function in the future. Matt Willis is the PI of the second phase.